Exactly one year ago today, on Oct. 17, 2017, Otto launched his first mission—Boost the ’Cuse, Syracuse University’s first-ever day of giving. With a goal of inspiring 1,870 donors to support SU in one day, Otto knew he needed to recruit a team of loyal Orange supporters to help him. Our mascot saw the power of Orange as the day ended with 3,997 donors who raised $1.3 million for Syracuse University—in addition to the $500,000 challenge gift from Life Trustee Daniel D’Aniello ’68. One year later, Otto is ready for a new mission—one that is bigger and more daring than before! Boost the ’Cuse II launches on Oct. 25. 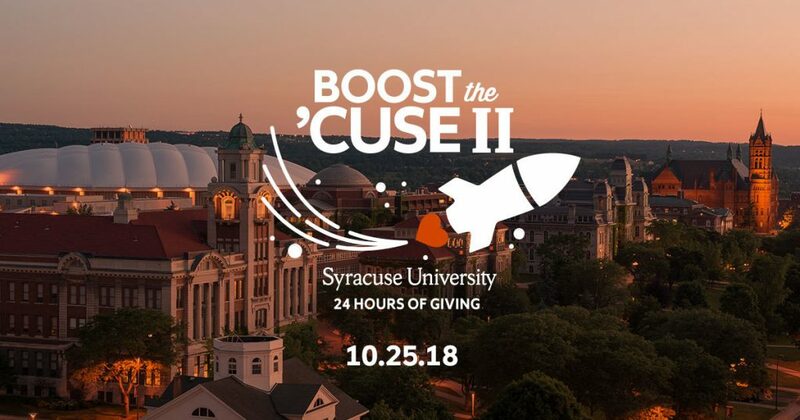 As we announced last week, Boost the ’Cuse II hopes to inspire 5,000 alumni, faculty, staff, parents and friends of Syracuse University to make a gift on 10.25.18. Thanks to the leadership and support of Syracuse University’s school, college, and unit advisory boards and regional councils from around the country, over $500,000 in challenge funds are ready to be unlocked. These challenge funds will ensure that your gifts on that day have an even greater impact.